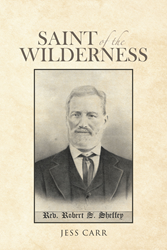 “Saint of the Wilderness”, from Christian Faith Publishing author Jess Carr, is a captivating and thoroughly researched biographical novel depicting the life and ministry of the iconic reverend Robert Sayers Sheffey, still a prominent figure of legend in four southern US states decades after his extraordinary life’s work in traveling ministry during the mid-nineteenth and early twentieth centuries. “Saint of the Wilderness” is an absorbing biographical novel of the life and ministry of Robert Sayers Sheffey. “Saint of the Wilderness” is the creation of published author Jess Carr, a prize-winning novelist and nonfiction writer born in Virginia who saw many of his works go on to win national acclaim and screenplay adaptation before his passing in 1990. Carr is survived by his three daughters, who republish this work, his fourth, posthumously. Carr writes vividly about Sheffey’s defining missions: “The route he had planned to take was the one that roughly paralleled the route of the Union soldiers when they had swept down upon southwest Virginia. Along this way the people seemed more despairing and downtrodden. There were families who still had not recovered from having all their grain stolen, their fences destroyed, and every farm animal, including the family milk cow, stolen. Those people who had not suffered from foraging enemy soldiers had, on occasion, suffered at the hands of marauding bands of scavenger troops. Republished by Christian Faith Publishing, Jess Carr’s book is a beautifully detailed, intimate journey of the eighty-two years in the personal life of this greatly adored, unique icon of Methodist Christian history. Carr’s words paint a living, breathing portrait of a man after God’s own heart, who, with an unfathomable depth of compassion and astounding prophetic talents, remains an inspiring example to all of mankind. View a synopsis of “Saint of the Wilderness” on YouTube. Consumers can purchase “Saint of the Wilderness” at traditional brick & mortar bookstores, or online at Amazon.com, Apple iTunes store, or Barnes and Noble. For additional information or inquiries about “Saint of the Wilderness”, contact the Christian Faith Publishing media department at 866-554-0919.